Don’t get me wrong – the tapestry is fabulous – all 230 feet of it and well worth a visit. (Especially if it’s raining, which, believe me, it will. Normandy wouldn’t be Normandy without the rain – it’s what makes it so beautiful and green). Displayed under glass in the Grand old Seminary in the heart of Bayeux, the tapestry depicts, in scenes woven on linen, the Norman invasion of Britain and has survived almost intact for nine centuries. The French do museums and exhibitions with typical style: there is a good audio guide to accompany the tour which explains events scene by scene. However, if you cross over the river Aure, towards the cathedral (also worth a look), and head south you will come to the British Military cemetery: a complete juxtaposition of historical events within a ten minute walk. 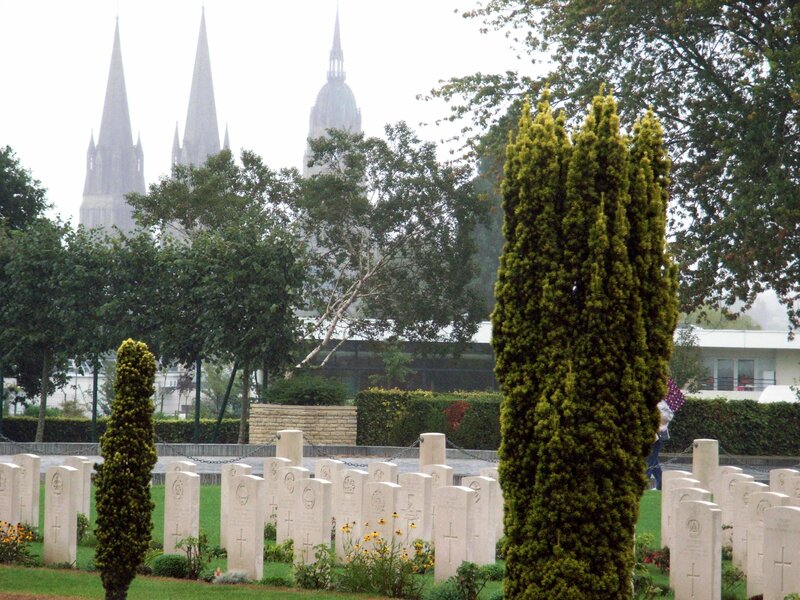 The grounds are kept in immaculate order by the war graves commission; all the white crosses have floral tributes. It is a sobering experience to walk along the rows, read the ages of the dead and contrast that with our own offspring, who at around the same age, are enjoying their gap years. Opposite the cemetery is the Musée Memorial de la Bataille de Normandie. 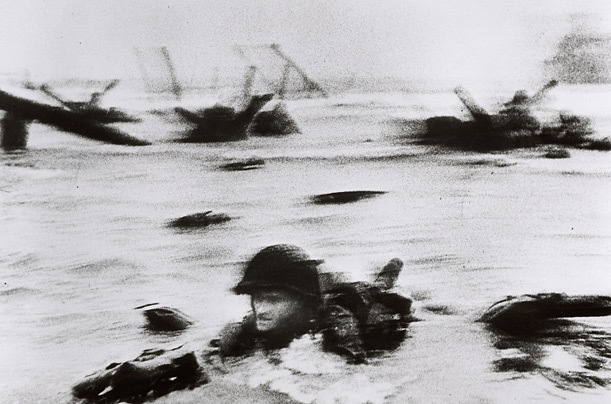 This is probably one of the best places for a comprehensive overview of the Normandy invasion. Easy to understand, with an archive film in both French and English, there are displays of military vehicles, maps and strategies, uniforms, and lastly, a room dedicated to the work of the photo-journalist. Outside, next to the museum, is a small, peaceful garden, dedicated to foreign correspondents all over the world, killed in the course of duty since 1944. 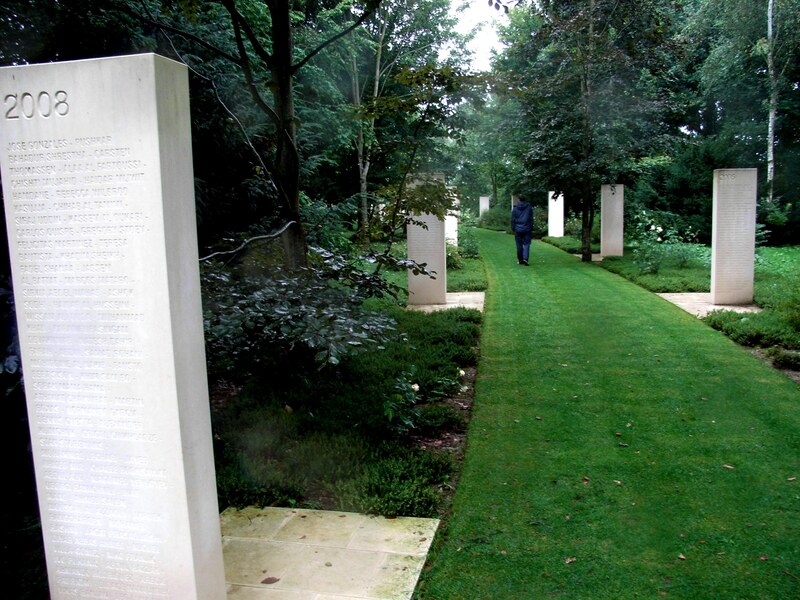 Called the Reporter’s Memorial, it contains over 2000 names, chiselled by decade onto large white remembrance slabs. New names are added every year and, since 1994, the town has hosted the Bayeux-Calvados prize for war-correspondents. Wander along the winding path between the upright steles and some names may be familiar: Robert Capa, famous for bringing images of the allies arriving on Omaha beach and who died, aged 40, in Vietnam; Georgi Markov, the Bulgarian dissident who worked for the BBC and who was mysteriously and fatally stabbed in the thigh near Waterloo Bridge in 1978; the Irish cameraman, Simon Cumbers, shot in Riyadh in 2004 – the same attack that left the BBC reporter, Frank Gardner, in a wheelchair. Journalists are often regarded with the same disdain afforded to estate agents or tax collectors: those that go out to report global combat should be set apart; they are not given military training, they put themselves in mortal danger to send the rest of us news and pictures that we are at liberty to switch off in the comfort of our living rooms. The Reporter’s Memorial in Bayeux is a fitting tribute. Last week I went with friends to see the National Theatre’s production of Alan Bennett’s new play, ‘People.’ We didn’t have to trawl all the way to London and worry about missing the last train home because we were comfortably ensconced in our local village hall, the play being beamed live and direct to us by satellite. This is where technology has my whole-hearted approval because although the excitement of attending a London theatre cannot be replicated, we had an excellent evening at a fraction of the cost. We were able to enjoy a drink before the performance and had the bonus of watching a short film of Alan Bennett talking about his play while the real audience found their seats. It was all very civilised. So what does he mean by a “pretend England?” I think he’s saying that our stately homes should be allowed to grow old gracefully, without the tarting up and titivation that the Trust affords them. He is decrying the movement towards the “themed” visits of which the Trust has lately become fond; tales of ghostly apparitions who woo visiting masses before they wend their way to the organically sourced produce in the cafe for a jolly nice tea. He’s also making the point that nowadays society only finds worth in something that has financial value; therefore crumbling old piles must be restored to within inches of their originality, often eradicating all traces of the families who used to call these dear old places home. I know what he means. I have been disappointed with several of the Trust properties I’ve visited. There is a dishonesty about them; they are too pristine; too polished. Volunteer helpers dressed in period costume hang around redecorated drawing rooms waiting to impart sparse knowledge of the period or family who once lived there – move away from frequently asked questions at your peril. It’s like trying to get an answer from your bank’s far flung call centre. I have, however, discovered not all the furniture and artefacts on display originate from the particular house: the Trust imports furniture and artefacts “of the period,” while several properties feature contract-weight fitted carpets, which, quite frankly, is just wrong. It’s not all bad, though. Chartwell, in Kent, the home of Winston Churchill, is a delight: the house gives one the feeling that Winston has just nipped out to nearby Westerham; his garden studio is left waiting for his return, tubes of half-squeezed oil paint strewn about, paintings half-finished, brushes ready. Likewise Greenway, Agatha Christie’s beautiful house overlooking the river Dart in Devon. Her wardrobe, a few dresses and a fur coat gently swaying on the rails, evokes a genuine spectral quality that no amount of themed storytelling can emulate. Back at the village hall during the interval, where the middle classes sipped glasses of warm Chablis or jostled each other for the last tub of stem ginger ice-cream, it occurred to me that here was the backbone of the National Trust’s membership bank; the same people who, just a few minutes earlier, had been laughing uproariously as the play unfolded. 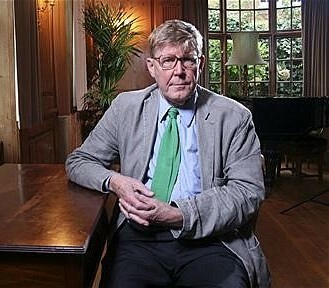 Alan Bennett is the master of observation; his characters, always flawed, are spot-on and usually deeply funny or traumatically tragic. He would have had a field day here, in amongst the mostly retired audience from the stock-broker belt, with his tongue wedged firmly in his cheek. But that’s the ultimate point, isn’t it? However curmudgeonly our dear playwright appears, he is a National Treasure and epitomises the faded Englishness he craves for the Trust, thereby giving us licence to do what we Brits do best. Laugh at ourselves.